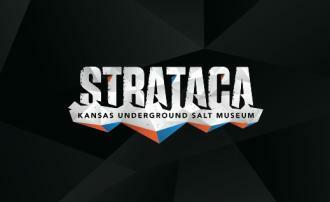 Strataca/The Kansas Underground Salt Museum is one of the 8 Wonders of Kansas. Located 650 feet beneath the earth's surface in a salt bed formed 275 million years ago during the Permian Period, Strataca is a truly unique destination. 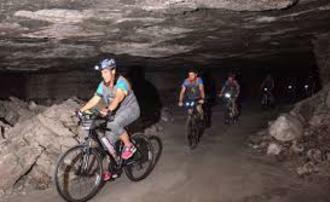 Experience the Dark Ride, the Salt Mine Express Train and the new Salt Safari Mine Adventure Hike, all in over 300,000 square feet of mined out caverns in an active Salt Mine. Reserve the Stratacenter for beautiful and unique events and conference space. Reservations strongly recommended! Hours vary by season, please check website. Closed on Mondays. Minimum age - 4 yrs. old. Description The Stratacenter is located 650 feet underground in an active salt mine. It accommodates 200 guests at round tables with 8 chairs each (provided). As a reception only area, we can accommodate 300 guests. A new restroom complex is conveniently located right outside the Stratacenter. There is also WiFi available underground. Underground admission to the Galleries is included in the rental fee. Space Notes One large room with enough space for smaller groups to break out separately for quiet sessions. Food and drinks must be catered and ready to eat.